ULTIMATE POWER DIRECTOR'S CUT #1 SQUADRON SUPREME MARVEL 2007 NICE!!. 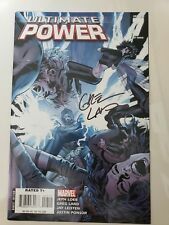 ULTIMATE POWER #8 (2007) MARVEL COMICS SIGNED by ARTIST GREG LAND! COA!